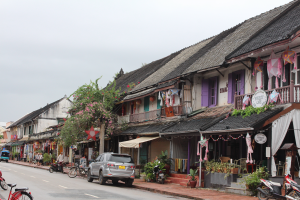 We were dropped off by the Mekong River in Luang Prabang. 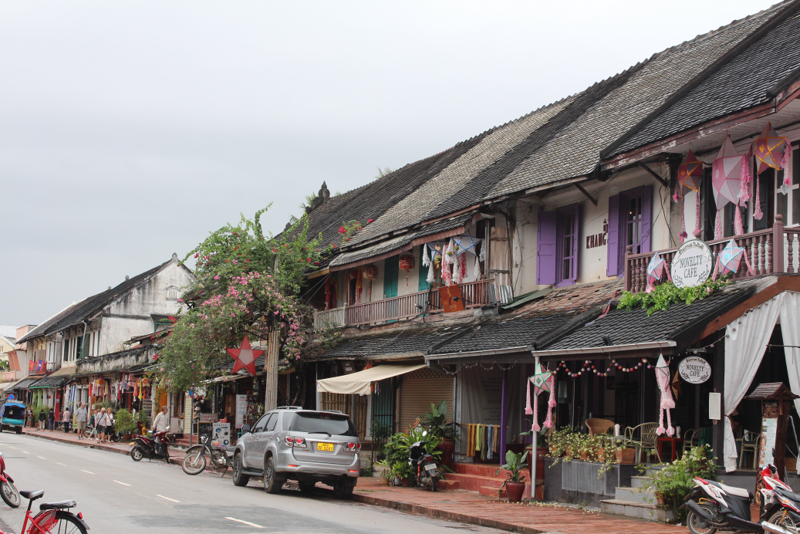 Our ride from Vang Vieng was over and we had a short walk up a narrow street to our guesthouse – Manichan Guesthouse. The family room we had booked consisted of a king size bed and a single. An adult would have to sleep with the two wriggly kids! Shortly after settling into the room we were warmly met by Andy who runs the guesthouse with his wife Venus. They have a daughter, Mali, who is a little younger than our daughter and Andy was keen for the kids to meet her. After meeting some other travellers in the communal area, the kids got to meet Mali and played with her for a while. A nice cafe was found for dinner and we settled in for our first night. Dad didn’t get much sleep during the night. Our daughter woke in the early hours and it took a long time to get her back to sleep. Despite having the single bed to herself Mum didn’t sleep great either. 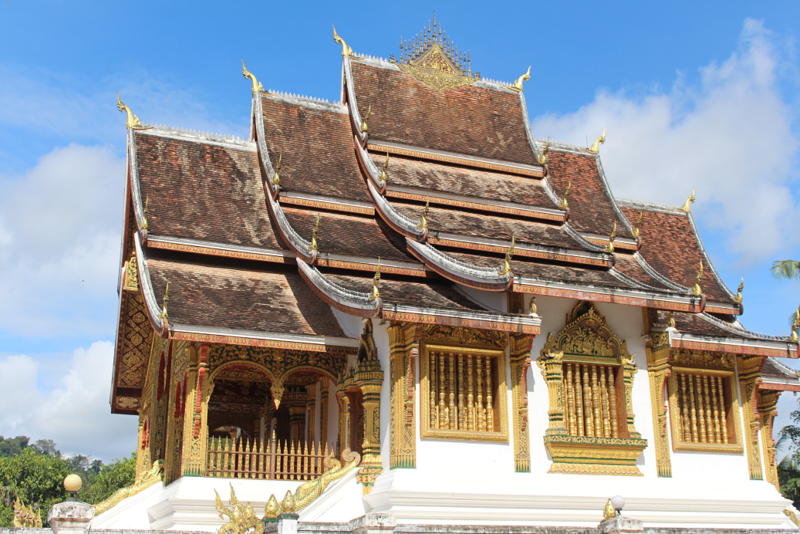 So it was with bleary eyes that we took the kids for a walk around Luang Prabang. It is a very charming town and very quiet with not too much traffic on the roads. Starting along the river bank we then made our way up some side streets and visited a few Wats along the way. We made our way down the main street and had some lunch before walking back to the guesthouse for an afternoon of learning. That evening we headed out to the night market for a look at the goods on sale. Having passed the Palace museum the day before, we decided that we would head there the next morning. It was beautiful inside with lots of artefacts. The grounds themselves were great and housed the impressive Haw Pha Bang. We slowly made our way back to the guesthouse and our daughter bartered for a new purse. She was very happy with her new purchase! Unfortunately, Mum felt sick the next day. However, Venus from the guesthouse suggested that Dad take the kids on a Tuk Tuk to La Pistoche swimming pool. That is what Dad did and what a little gem the pool was. There was a small splash park for kids and the main pool was large with rubber tubes you could lounge around in. Kids and Dad had fun here for the afternoon. Much had been made of the two waterfalls nearby so we decided to visit one of them today. 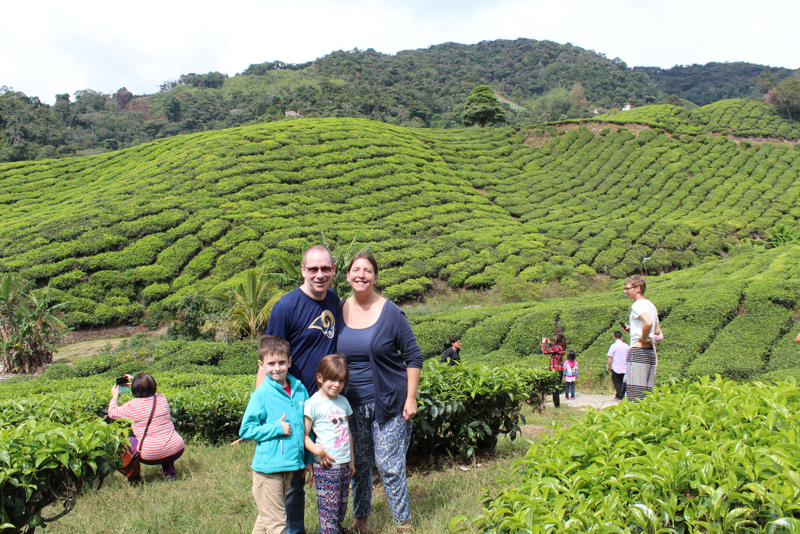 We haggled a Tuk Tuk to Kuang Si and stopped off at the butterfly park beforehand. 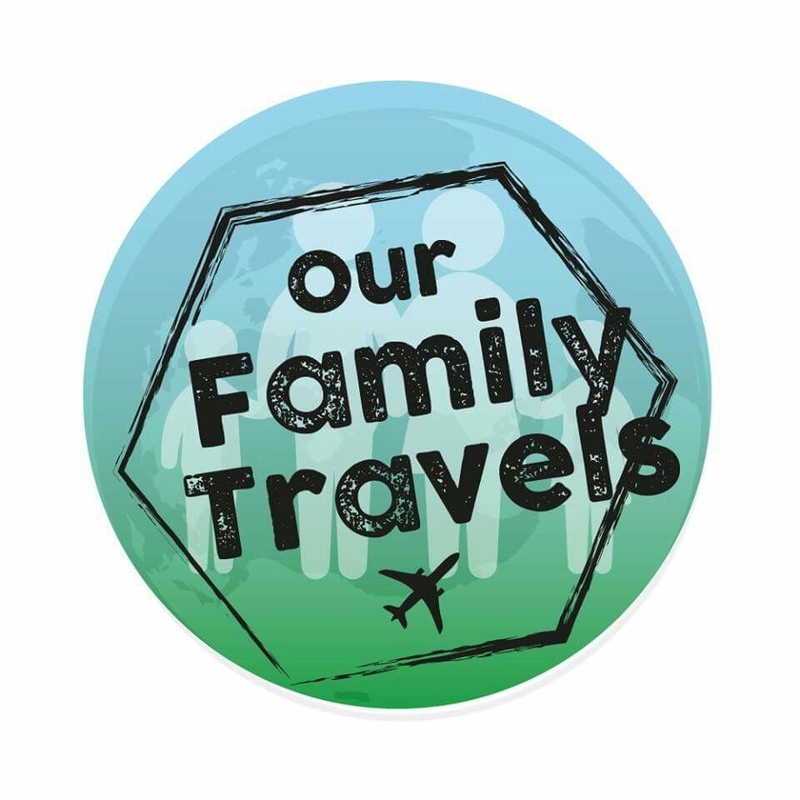 Olaf and his wife Ineke sold their house back in the Netherlands to set up the butterfly park and it was very informative. It was a very short drive from the butterfly park to the entrance of Kuang Si. Our Tuk Tuk driver parked up and we paid the entrance fee. Just inside the entrance was a sanctuary for moon bears. Rescued from poachers, these bears are then looked after here. Tourists help by purchasing T-Shirts. The money goes back to the sanctuary. We proceeded to walk up the waterfall train. Smaller turquoise pools formed along the way with little cascades which made for some spectacular scenery. We stopped at the on-site restaurant for lunch before a short climb up some stairs took us to the main waterfall. 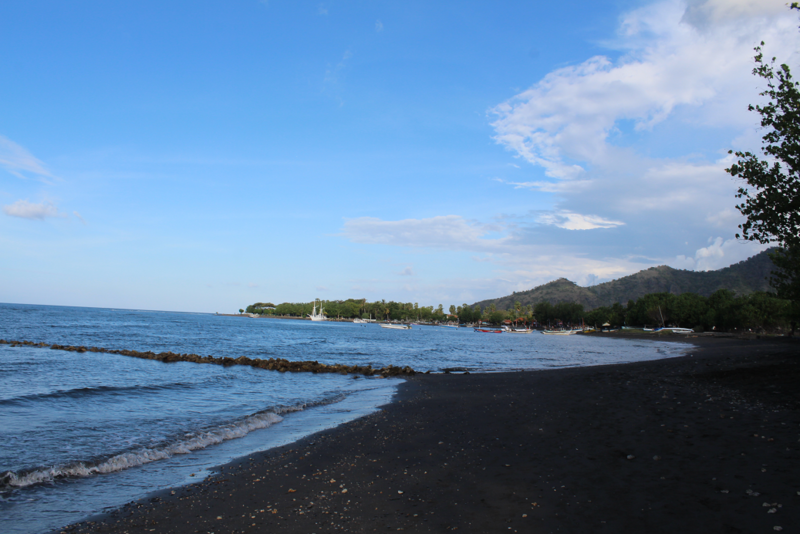 Despite the crowds of tourists, the view was breath-taking! After heading home on the Tuk Tuk we relaxed following a full day. Mum hadn’t experienced La Pistoche and the kids were keen to show her. So, after a morning of walking around some Luang Prabang sights we headed back to the pool and relaxed for the best part of the afternoon. 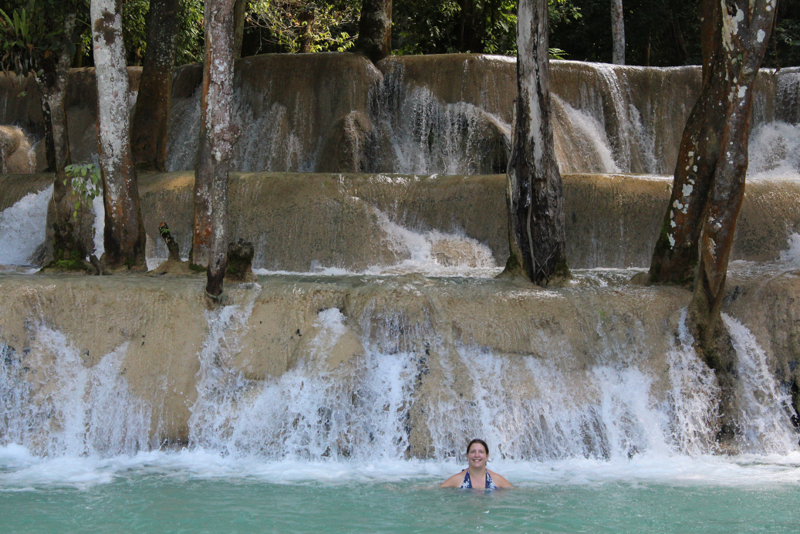 Since there are a couple of waterfalls close to Luang Prabang we decided to visit the second, Tad Sae. This was a shorter Tuk Tuk ride away but the final 10 minutes had to be in a small boat down a river. It was a great way to get to the falls. 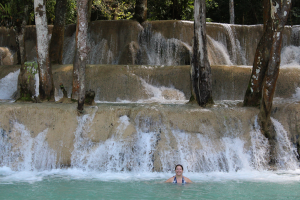 The waterfall itself was not as big as Kuang Si. The area in front of the waterfall where you could swim more than made up for this and we all got in for a splash about. 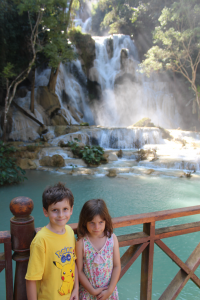 The kids loved the fact they were swimming by a waterfall. We chilled out that afternoon before taking a walk up the stairs of Mt. Phousi with a lovely Indian couple, Navin and Ruby, to watch the sunset. Since it was crowded at the top the kids didn’t really see too much and questioned why we had made them climb 300 odd stairs for this!! We made our way back down and walked through the night market one last time before dinner. We had a late flight on our final day in Laos. After checking out of the guesthouse we stored our bags and headed to La Pistoche for one last day of swimming. 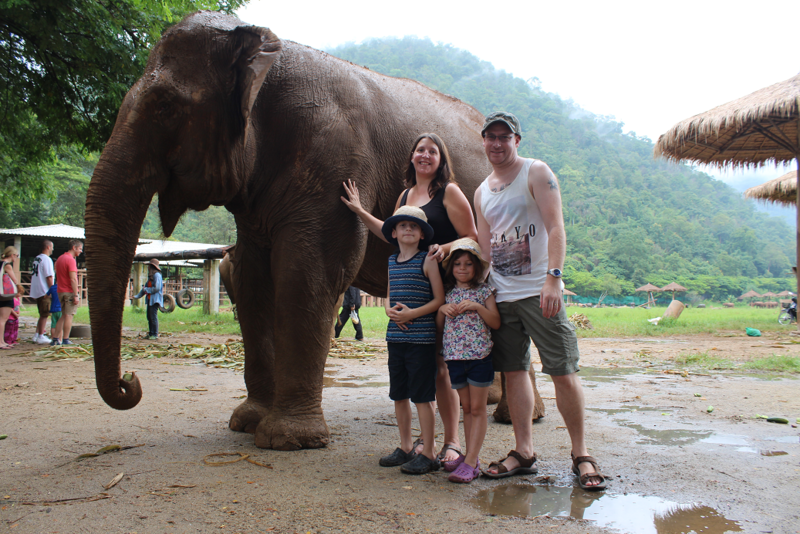 Saying goodbye to Andy, Venus and Mali was hard and everyone felt sad to be leaving Luang Prabang.